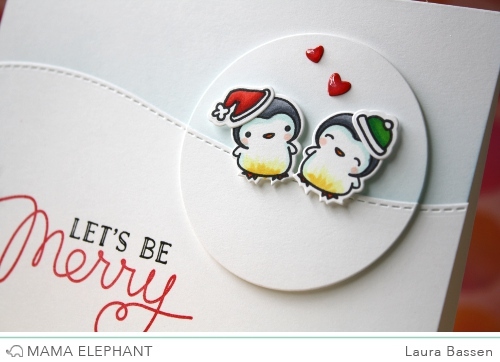 mama elephant | design blog: Jolly and Merry with Laura! Jolly and Merry with Laura! Hi there! 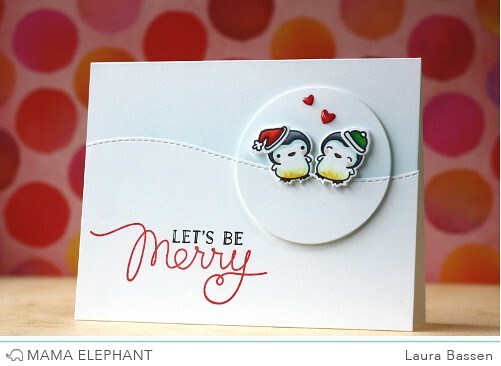 Laura Bassen here and today I have a cute little card featuring the new Jolly and Merry stamp set. Here's a little video to show how easy it is to make a popped up focal panel. Thank you Laura for the always funny and awesome video! I love your popped up penguin panel:) Too cute! This is just adorable! Love how you incorporated the snow drift into the circle - so clever Laura! This is just too darned cute!!! Thanks so much for sharing!! I love your videos, you always make me laugh. Your perfectly positioned popped up panel with penguins is positively adorable. This card is so flippin' adorable!! Love when Laura shares a video! Her narrative always cracks me up and her talent always inspires me! Laura is such a 'Star'!!! This card is absolutely darling!!! Fabulous card! Love the popped up panel and how it matches up perfectly! Love the card and really appreciate you sharing the "how to" since I just don't think of this by myself. I was wondering how you added that snowy drift to the poped up circle so perfectly. Thank you for the wonderful "how to" video!! I just LOVE those penguins, soooo adorable. Your card is sooo cute! Thanks for the learning curve on the edged snow scene. You did the teaching and I didn't have to struggle learning! So sweet! I love the soft blue too! Cute card, love that you incorporated the penguin hats with the bird set. Put off getting these last year but couldn't resist. Love this tutorial.